INTRODUCTION: All the science in the world isn’t helpful if people can’t understand it. This is a simple, yet accurate explanation of how we get high blood sugar, fatty liver disease, high triglycerides and high cholesterol. Science made simple. Most people know that Diabetes is having “high blood sugar” but just how much sugar is actually in the human body? An adult has 5 liters of blood circulating in their body at any one time. A healthy person’s body keeps the range of sugar in the blood (called ‘blood glucose’) tightly-controlled between 3.3-5.5 mmol/L (60-100 mg/dl) — that is, when they eat food with carbohydrate the body breaks it down to sugar, and insulin takes the extra sugar out of the blood and moves it into cells. Where does it put it? First, the body makes sure that glycogen stores are sufficient, which is the body’s “emergency supply of energy”. There’s about a day’s worth of energy (2000 calories) in our muscle and liver glycogen. Once the liver and muscle glycogen is full, the rest of the blood sugar is moved to the liver where it is converted into LDL cholesterol and triglycerides and then the rest stored in fat cells. Fat is where the sugar that we make from the food we’ve eaten goes if it is not needed right away. Fat is storage for later. So how much sugar is there in the blood of a healthy adult? 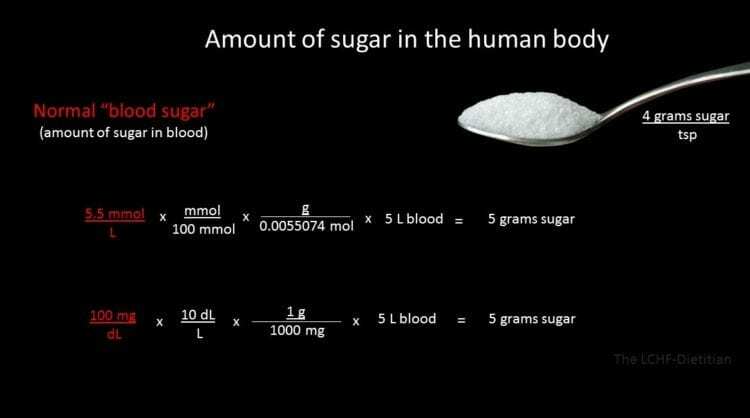 Doing the math (see illustration below), there are only 5 grams of sugar in the entire adult human body — which is just over one teaspoon of sugar. One heaping teaspoon of sugar in the entire adult body! How Do We Understand Diabetes in Terms of Blood Sugar? How much sugar does someone with Diabetes have in their blood compared to a healthy person? Someone with a fasting plasma glucose level of 7 mmol/L (126 mg/dL) meets the diagnostic criteria for Diabetes — which is just 6.25 grams of sugar or 1 -1/4 teaspoons. That is, the difference between the amount of sugar in the blood of a healthy person and the amount of sugar in the blood of someone with Diabetes is just a quarter of a teaspoon of sugar. A quarter teaspoon of sugar is such a small amount but it makes the difference between someone who is healthy and someone who has Diabetes. The difference between the amount of sugar in the blood of a healthy person and the amount of sugar in the blood of someone with Diabetes is just a quarter of a teaspoon of sugar. In a person with Type 2 Diabetes, the once tightly-controlled system that is supposed to keep the range of sugar in the blood between 3.3-5.5 mmol/L (60-100 mg/dl) is “broken”. When someone with Diabetes eats food with carbohydrate in it, their insulin is unable to take the sugar out of their blood fast enough, so the sugar stays in their blood longer than it should. Just as with a healthy person, the body of someone with Diabetes takes the sugar that results from the food they’ve eaten and ‘tops up’ their liver and muscle glycogen stores, then the rest is sent to the liver where it is converted into LDL cholesterol and triglycerides, and then the rest is stored in fat cells. Some people have the ability to store the sugar overload in the form of fat under the skin (called sub-cutaneous fat). In this way, obesity is a way of protecting the body from this sugar overflow. Eventually though, if the constant flow of carbohydrate continues, the ability of the body to store the excess as sub-cutaneous fat is limited and then fat around the organs (called visceral fat) increases and this is what ends up causing Diabetes and fatty liver disease. The problem with all of us (both those that are healthy and those with Diabetes) is that we never get to access our fat stores because we keep eating significant amounts of carbohydrate every few hours, storing the excess sugar in our fat stores. According to recent statistics, three-quarters of us lead sedentary (inactive) lives and barely get to make a dent in the energy we take in each day. As a result, we just keep getting fatter and fatter. We eat breakfast — maybe a bowl of cereal (30 gms of carbs) or two toast (30 gms of carbs) or if we’re in a rush we grab a croissant breakfast sandwich at our favourite drive-through (30 gms of carb). Each of these contains the equivalent of a bit more than 6 teaspoons of sugar. Mid-morning, maybe we eat a fruit – say, an apple (30 gm of carbs) to hold us together until lunch — and take in another 6+ teaspoons of sugar in the process. If we didn’t bring a fruit, maybe we go out for coffee and pick up an oat bar at Starbucks® (43 gms of carbs) — the equivalent of almost 10 teaspoons of sugar. At lunchtime, maybe we’ll have a sandwich (30 gm of carbs) or some leftover pasta from the night before (30 gm of carbs) or we’ll go to the food court and have a small stir-fry over rice (30 gm of carbs) — the equivalent of another 6+ teaspoons of sugar. Maybe we eat another piece of fruit mid-afternoon, this time an orange (30 gms of carb) — and we’ve provided our body with the equivalent of another 6+ teaspoons of sugar. In the scenario above, by mid afternoon (assuming we didn’t eat any fast-food or convenience foods, but only eating the food from home) we’ve eaten the equivalence of 24 teaspoons of sugar! If we go to MacDonald®’s and eat a Big Mac® (20 g of carbs), large fries (66 g of carbs) and a large soft drink (86 g of carbs) – we’ve eaten a total of 172 g of carbs – which is equivalent to 43 teaspoons of sugar in just one meal! In short, a healthy person will keeps moving the excess carbohydrate they eat off to their liver and will keep making triglyceride and LDL cholesterol out of it and storing the rest as fat and a person who is not insulin resistant or does not have Type 2 Diabetes will have normal blood sugar level, but their high carbohydrate intake can be reflected in their “cholesterol tests” (called a lipid panel) – where we may see high triglyceride results or high LDL cholesterol results or both. The body takes the triglycerides into very-low-density lipoprotein (VLDL) cholesterol. Think of these as “taxis” that move cholesterol, triglycerides and other lipids (fats) around the body. When the VLDL reach fat cells (called “adipose tissue”), the triglyceride is stripped out and absorbed into fat cells. The VLDLs shrink and becomes a new, smaller, lipoprotein, which is called Low Density Lipoprotein, or LDL — the so-called ‘bad cholesterol’. This is a misnomer, because not all LDL is harmful. LDL which is normally large and fluffy in texture is a good cholesterol (pattern A) that can become bad cholesterol (pattern B) when it becomes small and dense. In a healthy person, LDL is not a problem because they find their way back to the liver after having done their job of delivering the TG to cells needing energy. In a person with insulin resistance however ,the LDL linger a little longer than normal, and get smaller and denser, becoming what is known as “small, dense LDL” and these are the ones that put us at a risk for cardiovascular disease. There are two important points here: (1) the only source of LDL is VLDL not the fat we take in though our diet and (2) only the “small dense LDL are “bad” cholesterol and these occur as a result of insulin resistance. People often believe that because their blood sugar is ‘normal’ on a lab test, that there isn’t any problem, but as Dr. Joseph Kraft discovered in his 25+ years of research measuring blood glucose and insulin response in some 10,000 people, 75% of people with normal glucose levels are actually insulin resistant and are at different stages of pre-diabetes or “silent Diabetes” (what Dr. Kraft called “Diabetes in situ”). These people (and maybe their doctors) think they are “fine” because their blood sugar seems normal. Perhaps however, their triglycerides and LDL blood tests come back high. The origin of the problem is not because they are eating too much fat, but too much carbohydrate. Remember above, it is the excess sugar that is shuttled off to the liver, turned into triglycerides (protein linked fat) packaged up into VLDL and delivered around the body. Once the triglyceride is “off-loaded” to the cells for energy, the VLDL becomes LDL. The only source of LDL is VLDL. The body is trying to store the excess sugar somewhere. First it stores it in glycogen, then the rest is made into triglyceride and LDL and shipped all over the body, with the rest stored as fat. The fat cells in the body keep filling up — in the muscle, in and around our organs, and some get “fatty liver disease” and some even get fat cells in their bones if their body needs a place to put it. Bone is not supposed to have fat cells it in, but the body has to store it somewhere, because the carbohydrates just keep arriving every few hours! Imagine you are at home and you hear the doorbell ring. You go to the door and there’s a package and it’s for you. You take the package, close the door and head to the kitchen table to open it. Just as you’re about to open it, the door bell rings again. You go to the door, and there’s another package — and it’s for you, again. You take the package and head back to the kitchen and set it down beside the first, when (you guessed it) the doorbell rings again. You take that package and the ones that keep arriving, finding places to put them. When the kitchen table is full, you put the packages on the floor underneath the table, but then you get a delivery of several packages. You set those down wherever there’s a spot, just in time to answer the door yet again. Package after package arrives and before you know it, you look like something out of the TV series Hoarders. You can barely move for all the boxes, and all of them are unopened. This is what eating meals and snacks with carbohydrates in them every few hours is like. We overwhelm our body’s tightly-regulated system that is supposed to maintain our blood sugar level between 3.3 and 5.5 mmol/L (60-100 mg/dl) by continually requiring it to process the equivalent of anywhere from 6 teaspoons of sugar in a bowl of cereal or two toasts to the equivalent of 43 teaspoons of sugar in a fast-food meal. This is how the system gets “broken”. In time, we may get Type 2 Diabetes or fatty liver disease or high triglycerides or high cholesterol or group of symptoms called Metabolic Syndrome. This is the result of the constant strain we put our bodies under by eating a steady diet of foods containing a large percentage of carbohydrate. It is easy to see where the high rates of obesity and Diabetes have come from. We have become a nation of “hoarders”. We stop the constant delivery of packages of carbohydrate every few hours. We feed our body the protein and the nutrients it needs with enough fat to use as fuel (in place of carbs) and allow it to take the extra energy it needs from our “stored fat”. We finally take the fat out of storage and we do this by following a low carb high fat diet. 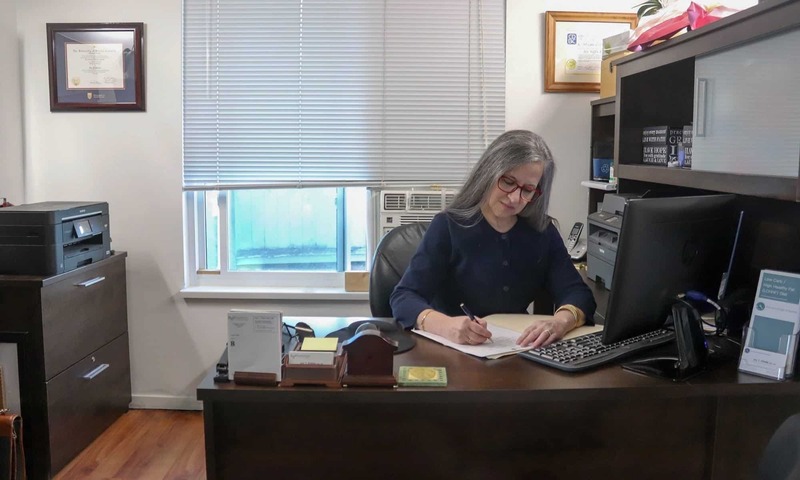 Please send me a note using the “Contact Me” form above and for a complete summary of my services (pdf format), click here.